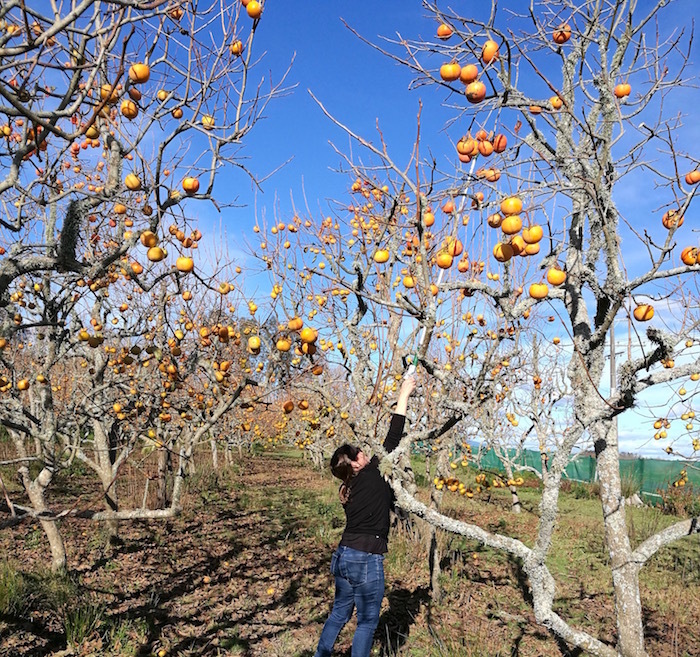 Last weekend my friend Jane texted: “Let’s go and pick persimmons!” So on a sunny Saturday afternoon we drove out to the persimmon orchard at Matangi and collected some huge bags of gorgeous orange fruit. It was by far the easiest and most rewarding “pick your own” experience I’ve had. Much quicker than picking strawberries or blueberries! And cheaper, too. $1 per kilo. You can buy bags already picked for a few dollars more. The orchard was filled with families pushing trolleys laden with fruit. Persimmons are sweet, crunchy and slightly astringent (mouth-puckering). They’re great to eat as they are. I prefer to peel them, but not everyone bothers. If you have a dehydrator, persimmons also make beautiful dried fruit. 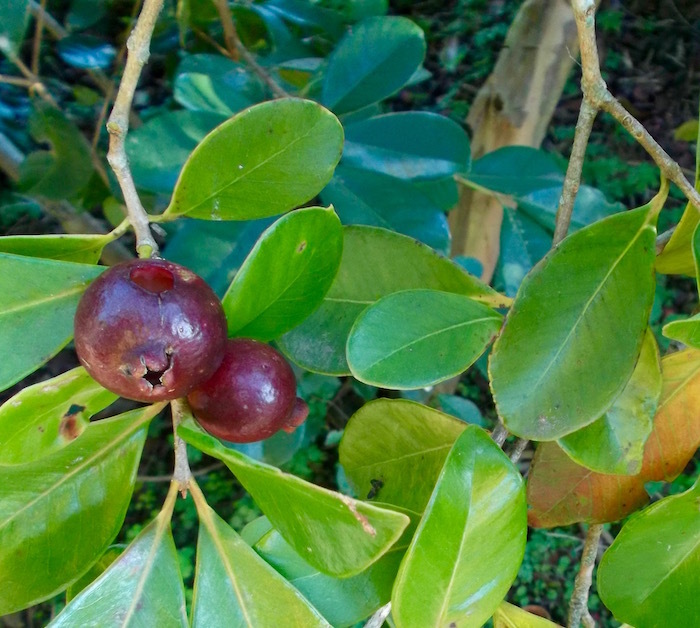 Here’s a link to a post I wrote about persimmons, Persimmons – for people or birds? Above: Jane skilfully wielding the persimmon picker. At this time of the year there’s a great range of fruit around in Hamilton. You just need to know where to look. To start with, it’s kiwifruit season. A big treat of the Hamilton Farmers’ Market is local organic horticulture veterans Dyan and Peter Downard with their certified organic kiwifruit. They export most of their crop – we’re lucky to get the seconds for a few weeks at this time of year. (And if these are the seconds, I can’t imagine what their export quality kiwifruit taste like.) Here’s a link to a post I wrote about the Downards, Organic Kiwis in Season. Even in my garden there’s fruit. There are still a few late feijoas, and our mandarin tree is laden. 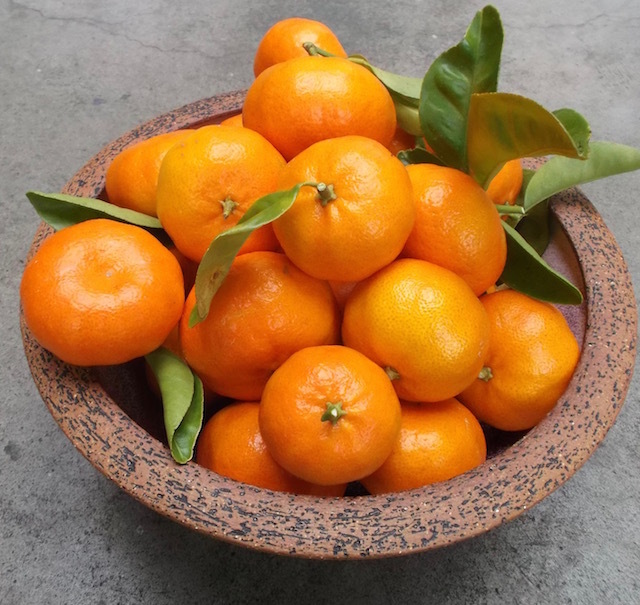 The mandarins aren’t yet perfectly sweet yet, but they’re ripe enough to start eating. We also have local apples – my ukulele playing friends Keith and Janice have tree-ripened Granny Smiths in their Riverlea garden. The skins have a bit of mould (Keith says apologetically) but the apples are wonderfully sweet. And wait – there’s even more! Down the road my friend Clare has a hedge full of zingy red guavas. With such amazing bounty, who needs to buy imported out-of-season grapes and grapefruit? 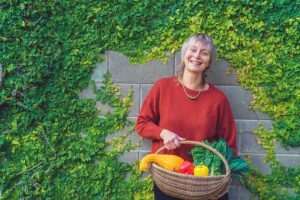 In the Waikato – and actually in most of New Zealand – you can eat freshly picked fruit all year round, if you plan your home orchard well. Here’s a link to my article about which fruit ripens each month in the Waikato, Local Fruit in All Seasons. And here’s a link to the ebook that Clare Jackson (of Green Footprint) and I co-wrote, How to Plant a Fruit Tree. When you know you’ll have freshly picked fruit all year round, you don’t even need to bother with preserving. Unless you really want to – my son Tom has just made us a batch of spicy apple chutney. Matangi Persimmons, 436 Tauwhare Rd, Matangi. There are still persimmons to pick for a couple more weeks, depending on the weather. You can also buy persimmons at the Hamilton Farmers’ Market. The Waikato Tree Crops Association is holding the annual tree and plant sale on July 1st at Hamilton Gardens.